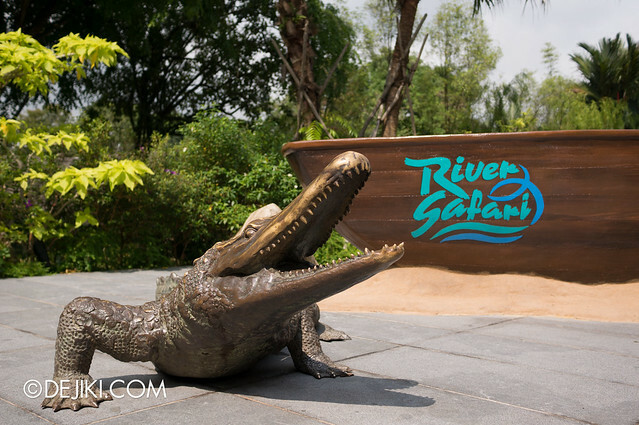 River Safari, Asia’s first and only river-themed wildlife park, soft-opened in April 2013. The park’s key attractions include Rivers of the World – a series of exhibits based on iconic rivers around the world; Giant Panda Forest – which houses celebrity pandas Kai Kai and Jia Jia; Amazon River Quest – a boat ride through habitats of the wild Amazonian river; and finally Amazon Flooded Forest – the largest freshwater aquarium in the region. This is a short entry covering general information about the River Safari park as well as my review. 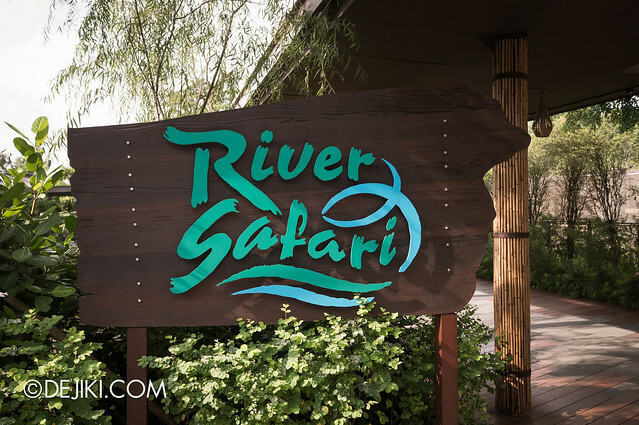 The River Safari Photo Tour, with pictures of exhibits, will be up next. 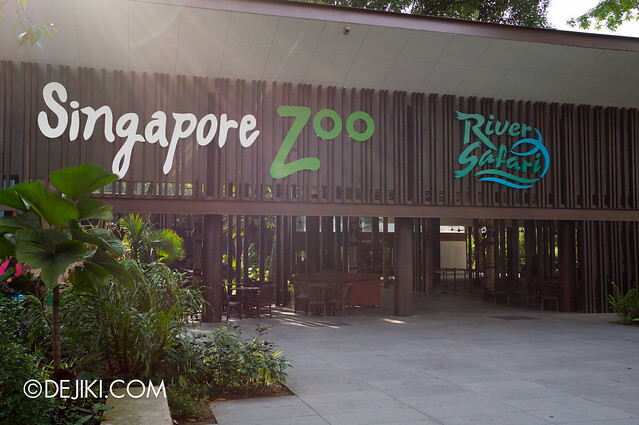 River Safari is located in between Night Safari and Singapore Zoo. It is accessible via public buses from Ang Mo Kio, Woodlands and Choa Chu Kang bus interchanges. I took Bus 138 from Ang Mo Kio and it was a 40 minute journey. Once you see a coach/bus parking area on the left (and Night Safari entrance on the right), you know that’s the stop to alight. 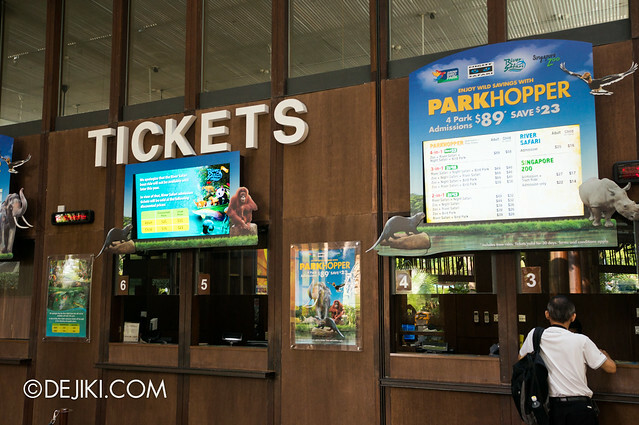 Tickets can be purchased online or onsite: at the Singapore Zoo ticketing counters or River Safari Visitors’ Services counters. Due to the unavailability of exhibits in the Wild Amazonia zone (such as Amazon River Quest), tickets are sold at a discount during the soft opening period. Park Hopper Specials, or Multi-Park tickets are also available. Click here for more details. The Park Hopper tickets are bundled admission tickets to the parks, valid for 30 days from day of purchase. While it is called “park hopper”, guests are only allowed one visit to each park purchased in the package. A thrill ride (most likely with no exhibits) beside Amazon River Quest. This attraction is either shelved or cancelled. The land allocated for this attraction is undeveloped. An elaborate experience to view polar bears and other animals from the arctic region. Supposedly placed after Giant Panda Forest, but it has been moved to the Singapore Zoo instead. This will be ready in June 2013. 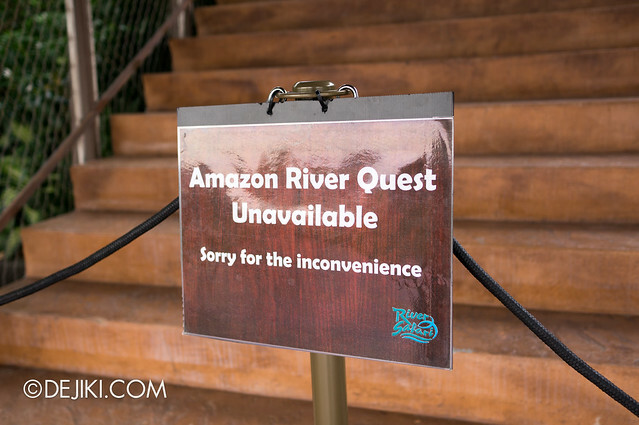 This is a short review which may be appended when Amazon River Quest is open. 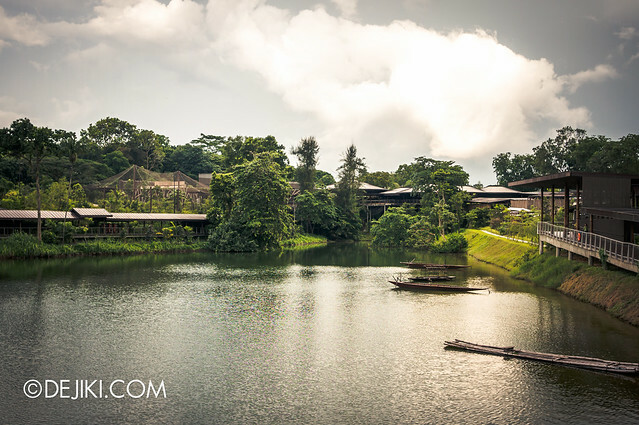 Wildlife Reserves Singapore (WRS) is no stranger to wildlife parks, having the world-renown Singapore Zoo and Night Safari in its portfolio. River Safari, being the fourth park, is built with the same high standards. There is a wide variety of specimens on display, and the exhibits are accompanied with well-designed signs and information boards. They are mostly filled with quick facts and are simple to understand. River Safari is smaller than its two sister parks, Singapore Zoo and Night Safari. A tour around all exhibits should take less than two hours (possibly even with the Amazon River Quest boat ride and waiting time in the queue), making the park feel more like an add-on. The park makes up for its size with quality exhibits. The various zones in River Safari are heavily themed and evokes a sense of journey through the exhibits. The Amazon Flooded Forest, located at the end of the trail, gives a grand finale to the River Safari experience. The heavily sculpted environment creates the experience of walking through a cavern filled with flora and fauna in its sunken waters. The Giant Panda Forest is a modern panda complex, with giant pandas and red pandas. I feel that the pandas are getting so much attention that it detaches from River Safari. This is further strengthened with a incredibly wide range of specially designed products based on the pandas. The panda plush toys are “appropriately priced” to their celebrity status: $29.90 each. However, some sections are too small – River Nile section being outstandingly short. There are also areas in the Rivers of the World where exhibits were not available at time of writing. 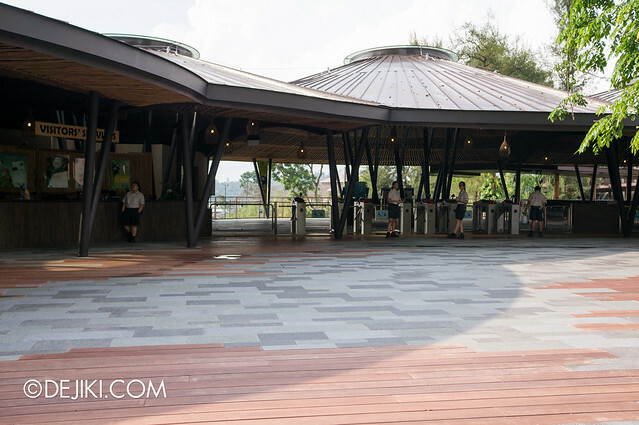 The most understated attraction of River Safari would perhaps be the walkway circling the “pond”. 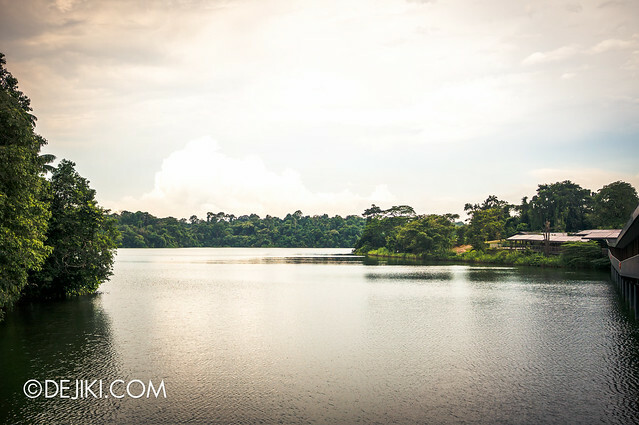 It offers great views of Upper Seletar Reservoir and the dense forests that surround it. One thing I disliked about the exhibits: Some can be very hard to view. Due to the “open” design of Rivers of the World, several acrylic panels gather glaring reflections, making it challenging to see (especially the tanks along the first half of Rivers of the World). 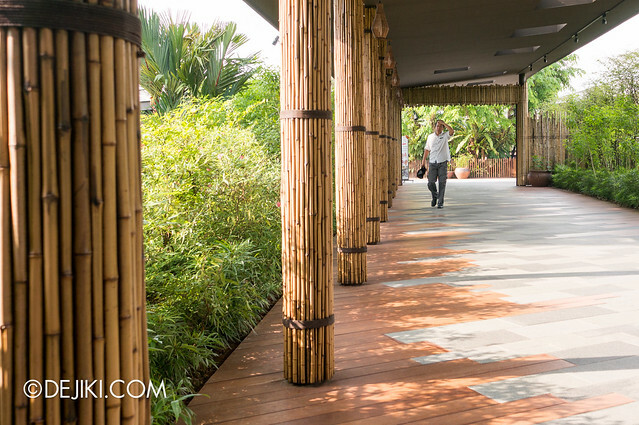 The walkways are mostly sheltered, making it comfortable – rain or shine – to walk from the Entrance Plaza, Rivers of the World, Giant Panda Forest and Flooded Amazon Forest. The walkway passing Wild Amazonia is covered, but the exhibits in that area is not. River Safari is a pricey experience, even with discounted tickets. With only 2/3 of the park open, visitors may feel shortchanged when the experience lasts less than two hours. However, the shorter experience may be welcomed by visitors who feel that the Singapore Zoo is too tiringly large (and messy) to explore. I have received a lot of comments and questions about the size of River Safari, so yes, the assumption that it is small is correct. Amazon River Quest may change perspectives if it is be more than just a leisurely transport around exhibits. While the two parks are very different, I feel that River Safari has done better in certain aspects, especially in the field of information design. 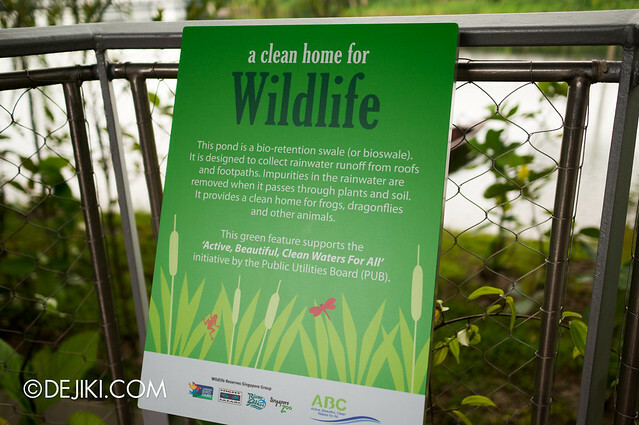 The signage about exhibits and their significance in ecosystems are easy to understand, and placed at the correct height for visitors of all ages. The signage at River Safari makes it very easy and intuitive to identify species from the tank. River Safari also has the advantage of showing a larger variety (not just marine life) due to its theme. Of course, the presence of an actual river and natural environments greatly enhances the experience. Once you have walk to the end of the trail can you walk backwards back? To see all the exhibits again? You can walk around the park in any way you wish! On days of high attendance, it might not be possible to re-enter Giant Panda Forest (in either direction) if the “Panda Viewing Booking” system is in use. However, there is another path (by the park’s river/pond) that bypasses the Giant Panda Forest. Pretty sure it would be quite exciting if it was opened sooner as the main attractions for River Safari are the pandas as well as baby manatee of course!